Waiting until after Christmas to make purchases on big ticket items can really pay off, since a lot of retailers have sales to clear out unsold merchandise. 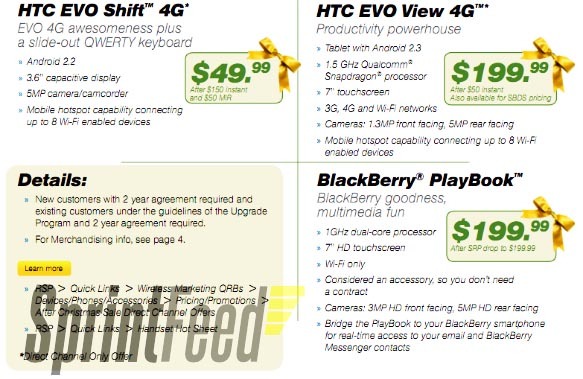 If you're still in the market for a BlackBerry PlayBook and missed out on some of the sales that were recently underway, you can head on over to Sprint between 12/26/11 and 1/7/12 and pick one up for just $199.99. Since the tablet is considered an accessory, you don't need to worry about being a Sprint customer or contracts. If Santa doesn't leave a PlayBook under your tree this year, do you plan on taking advantage of future sales and buying one? Thanks for sending this in Mark!